National Drug Take-Back Day is set for later this month. 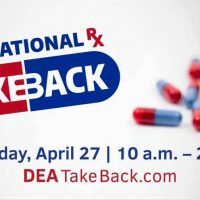 According to a news release, the Boonville Police and Fire Departments and the U.S. Drug Enforcement Administration will give the public its 17th opportunity in nine years to prevent pill abuse and theft by ridding their homes of potentially-dangerous expired, unused and unwanted prescription drugs from 10 a.m. to 2 p.m. on Saturday, April 27, at the Boonville Fire Department at 500 Bingham Road. The service is free and anonymous, no questions asked. However, sites cannot accept liquids, needles or sharps. They can accept only pills or patches. Last fall Americans turned in more than 900,000 pounds of prescription drugs at more than 5,800 sites operated by the DEA and almost 4,800 of its state and local law-enforcement partners. Overall, in its 16 previous Take-Back events, the DEA and its partners have taken in almost 11 million pounds- nearly 5,500 tons- of pills. For more information about the disposal of prescription drugs or about the Take-Back event, visit the website, www.DEATakeBack.com.